It’s very hard to think up snarky things to say about a game with the subtitle of “Back with a Vengeance,” but I will do my best. 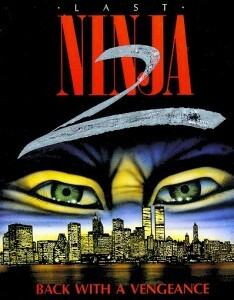 The aptly titled Last Ninja 2 is the unmistakable direct sequel to the smash hit The Last Ninja. Good details are scarce, but from what I can gather with the video above, you are back again to avenge your lost brethren by kicking and slicing the hell out of everything you see while solving clever ninja-puzzles. Actually, I just found the description of the game. Ninja + Manhattan = good times. All of my hopes and dreams are coming true every moment I think about this game. Once can only hope that somewhere you get to fight a Ninja Turtle or at the very least the Naked Cowboy. The ninja known as the Mystic Shadow Warriors were the elite fighting force of ninth century feudal Japan. The evil Shogun Kunitoki has once been beaten but has gathered all his mystic powers to create a modern day tyranny in Manhattan. Encounter your arch-enemy Kunitoki within the urban jungle and conquer him with your Ninja style skills. Transported to Manhattan of 1988 by an unknown force, the ninja leader Armakuni needs to find a way to defend himself against the unknown dangers that lie before him. Will this be the final battle? Can you vanquish the evil Kunitoki once and for all? There really is not a whole lot more to say about this game that has not already been said about the original. The gameplay looks the same, and graphics are roughly the same (although there is now a cool ninja head at bottom right hand corner that blinks every once in a while), but now there are bees. BEES! OH LORD THE BEES! Also, if the soundtrack for the game is not the music that is playing in that video, I will have to punch something. The first aspects of the game you should master are the joystick controls. The highly interactive nature of the game is required because of some of the complex moves the Ninja character has to perform. A high level of competence at the controls will enhance your game play considerably. Because of the adventure elements our second suggestion is that you should get into the habit of recording what happens on each screen. This will enable you to get higher scores with repeated play. The last point is, never take anything for granted – some things are not as they appear. Be curious, nosey, etc. and examine everything.